Think of how invasive it would feel to come or arrive at your office to find there was a break-in. The security alarm industry offers such a wide selection of systems with varying features and functions that picking a security system for your home or business can often feel overwhelming. 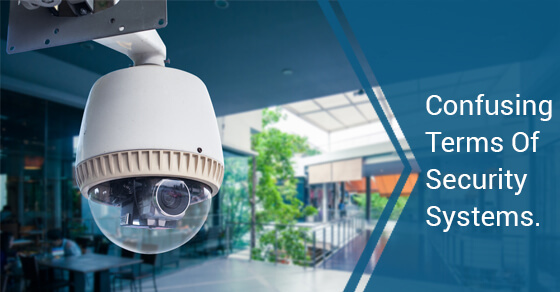 It is extremely important that you not only understand the different types of security systems, but also familiarize yourself with the industry jargon and technical terms used to describe the equipment, capabilities, and functions when choosing your security system. DIY Installation: The term DIY (Do-It-Yourself) is mostly used with wireless systems that come with adhesive backing on the sensors so most homeowners can set up the equipment easily and quickly without having to schedule time for a professional installer and pay an installation fee. Wireless: Wireless describes equipment that uses radio frequencies to relay signals between the sensors and control panel. Otherwise, the communication would be wired with cables connecting the sensors to the control panel. Cellular monitoring: Refers to systems that communicate with a monitoring centre wirelessly (100 percent) via a cellular uplink instead of a broadband or landline internet connection. It is very fast, safe, and effective as there are no wires to cut. Landline vs. broadband: Landline systems use the cable phone connection to send signals to the monitoring centre when the alarm is triggered, though the security system itself could be wireless (see item #2). With broadband systems, the signal is sent through a broadband internet connection, which is more than four times faster than the landline connection. Mobile access: This refers to a security system that lets you arm/disarm it from a smartphone, or web-enabled device. Some companies also offer the option to control thermostat settings and lighting via mobile access, giving you total control over your home or business. 2-Way Voice: This is a common add-on feature that allows the user to speak directly to a monitoring centre representative through the control panel. In the event of an emergency, if you can’t get to the control panel, this feature allows you to communicate with a representative as long as you’re able to picked up on the mic, often from up to 75 feet away. Geo-fencing: This involves the use of Radio Frequency Identification (RFID) or Global Positioning Systems (GPS) to establish geographical areas that trigger different responses with your security system. For instance, your alarm system could be set to disarm when the key fob comes within a 150-foot radius of the control panel. These are just some of the terminologies you may come across when shopping for a security system to help you alleviate any confusion.